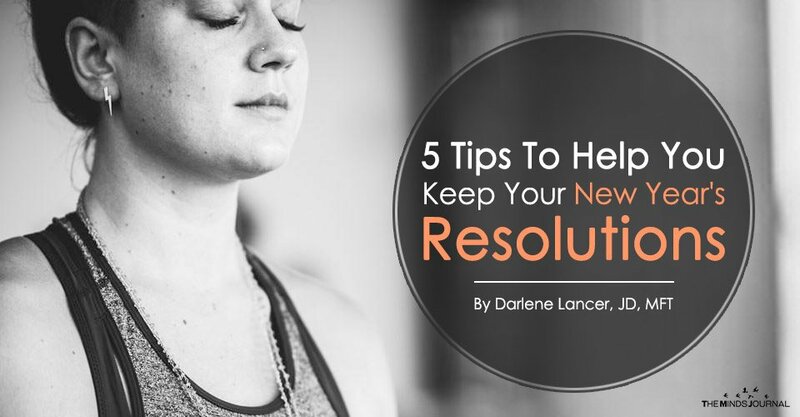 Why bother to make resolutions and then feel disappointed or guilty for breaking them? Do you get excited and resolve to change, but within days or weeks lose interest and can’t motivate yourself? Wonder why you get sidetracked by distractions or become easily discouraged when quick results aren’t forthcoming? When you think about goal setting, you realize that it’s a process and that requires effort to reach your target; whereas a resolution is a decision or intention. It has to be more than a wish, but it’s only the first step in reaching a goal. There’s no implication that planning or effort is involved. It’s as if saying it makes it so. Naturally, it doesn’t. Change isn’t easy. Instead of making several New Year’s “resolutions,” make ONE you can keep, and it will give you confidence that you can do more. Change requires work. To be motivated, your heart has to be in it. To realize your goals and resolutions, you must be inspired and really want to make the effort necessary to leave your comfort zone. Inspiration infuses you with energy and power. It stimulates your creativity, promises a better future, or connects you to a larger purpose. It fills you with positive emotions that overcome fear and inertia. Love mobilizes parents to work hard and protect their children, disregarding their own comfort and safety. For change to last, make sure your motive expresses your true self and fosters your highest good. Your goal must be congruent with your core beliefs. Resolutions to make changes for someone else’s approval, for monetary gain, or because you think you “should” are hard to sustain. In addition to desire and motivation, you need self-discipline. It’s been said that success is 99 percent perspiration and one percent inspiration. Change requires focus and sustained effort before results are noticeable. The process is not a straight path, but a spiral of movement forward, slips, stagnation, and leaps ahead. It’s easy to get discouraged and be swayed by the pull of habit. Expect to feel discomfort. You may feel confused, awkward, or anxious. Studies show that on average that changing habits requires at least two months of vigilant monitoring, and they still sneak up on you. Be patient. Continue to exert your will-power, and over time your persistence will pay off. For years, every January I’d make resolutions and set goals for the coming year. Twelve months later, I’d see if I’d accomplished them, never considering the “how to” middle part. Of course, “good intentions” didn’t get me very far. I’d get overwhelmed and lose confidence when I thought about a major goal. Break it down into smaller steps by month, week, and daily to-do lists. Actionable steps become manageable and doable. People often seek therapy to raise their self-esteem or overcome addictions and codependency. If your resolution is to change your habits, self-awareness and vigilance are needed in order to interrupt old patterns. Daily meditation and journaling are potent and helpful tools in monitoring and changing your thoughts, feelings, and behavior. Discouragement is normal. Become a positive coach, and continually give yourself positive feedback, praise, and recognition. Look for small signs of progress and celebrate them. If you have low self-esteem, you may talk yourself out of your desires and think you lack the skill, worth, or ability to achieve them. Underlying depression does the same thing. Self-doubt and negative self-talk paralyze you in a past expression of yourself. They sap energy and motivation, and can easily persuade you to give up. These are great tips. Creating an action plan is one I really struggle with. I make all these lofty goals, and then don’t make a plan for how I’m going to achieve them. I’m approaching that differently this year. I’m actually blogging about it. I wrote a post about my resolutions (and what my plan was for keeping them. I just completed my first weekly update on my progress.